As sleepers go the 2019 class still has their fair share of them with a number of late blooming prospects on the board that low and mid major Division 1 schools need to be taking a strong look at. Front and center in that conversation regionally is sharpshooting guard Sean Houpt of Danville High School in Illinois. Equipped with a long lanky 6-4 195 pound plus frame, Houpt is a classic catch and shoot marksman in the truest sense. Flaming the rim from beyond the arc with a consistently efficient and smooth left handed stroke, Houpt was virtually unstoppable at this this past July as he helped his grassroots team to deep tournament runs while flipping the scoreboard game in and game out. He can catch and shoot from anywhere on the court, his pull up off the bounce is solid, and his ability to spot up and rip the nets from beyond the arc in transition is consistently lethal to opposing teams. Athletically he’s solid as well vertically and he has nice agility and the ability to put the ball on the court occasionally. With perimeter shooting always a necessary at any Division 1 level, Houpt is as solid a perimeter shooter as there is left on the board in the Midwest and he could be an absolute steal for schools at multiple Division 1 levels including the Ivy league due to his exemplary grades and test scores. Air Force, Cornell, UW-Milwaukee, Minnesota State-Moorhead, Hillsdale, Minnesota-Crookston, Quincy, Michigan Tech, UIS, Benedictine, SW Baptist, U of Mary, and Southern Indiana have shown interest in Houpt. One of the best kept secrets in the 2019 class regionally, the right school that takes a chance on Houpt may end up with a huge windfall as the young man can take over games with one of the best pure strokes left on the board in 2019. 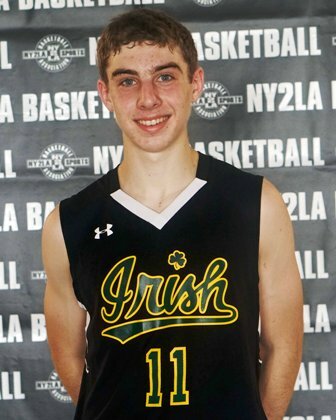 Houpt played with the Illinois Irish during the grassroots travel season.